While we are staunch supporters of Boston’s exploding restaurant and foodie scene, we’re also a fan of cheap, cheerful, and convenient—which is why we absolutely adore Boston’s equally as exciting food truck scene. There’s nothing better than stopping by one for lunch, as just about any type of cuisine is offered on four wheels these days. We’ve compiled a list of a few of our favorite trucks and menu items that operate from nearby Dewey Square (diagonally across from South Station) during weekday lunch hours from 11-3. While it may be a gamble to offer Asian-American fusion just a few blocks away from Chinatown, this popular food truck has amassed quite the following from its unique fare. The Double Awesome, a scallion pancake sandwich comprised of pesto, cheddar, and oozy eggs, more than lives up to its name. Be sure to also check out the pierogi dumplings stuffed with potatoes, cheddar, and veggies served up with a side of sriracha fried rice and pickles. Sometimes there’s nothing better than comfort food. We’re a fan of starting with an old classic like the Rookie Melt comprised of Vermont cheddar and tomato. The Green Muenster made of—surprise!—muenster cheese, bacon, and house made guacamole will make anyone not noshing green with envy. For those feeling particularly adventurous, the Mighty Rib Melt made with fontina, braised short rib, and carmelized onions make this hearty offering the perfect thing to warm you up on one of Boston’s bitterly cold days. This family-run food truck offers an amazing, rotating seasonal menu that keeps crowds coming back just to stay abreast of what’s new. One current offering that has us weak in the knees is the beef dip sandwich made with flank steak, jus, sambal aioli, and lime pickled vegetables. The roasted turkey sandwich comprised of cranberry and porchetta burnt ends stuffing and apple butter is also a must. For those looking for soup, the numerous rotating options like red kuri squash with pepitas and curried carrot are sure to please the palate. 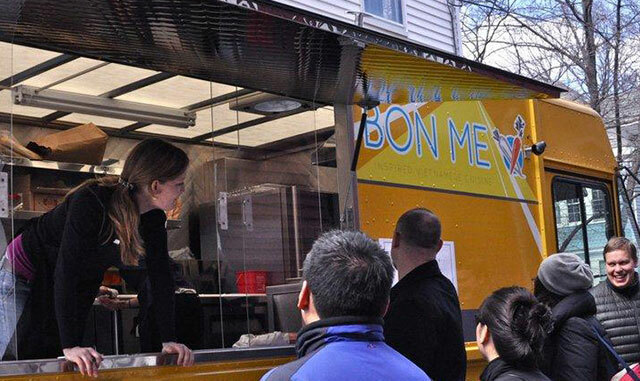 One of Boston’s most popular food trucks, Bon Me is quickly growing with actual brick and mortar locations (one recently just opened in nearby Fort Point); however, be sure to make it to Dewey Square to get the full, food-on-wheels experience. Patrons flock to the Chinese barbeque pork sandwich, which is a sweet and savory take on Chinese roasted Char Siu pork and comes loaded with such goodies as pickled carrots and daikon, housemade spicy mayo, and pork pate on a toasted baguette. All of these offerings are a ten minute walk away up Congress Street or just hop on the MBTA Silver Line at the World Trade Center station and go two stops to South Station. Of course, if you are feeling like even Dewey Square is a bit too far, fear not! TAMO Bistro and Bar here at the hotel has a special “Food Truck Nation” portion to the menu. Sample such street fare as chicken and waffles served with coleslaw and green-tomato jalapeno jam or dive into Nepalese Dal Bhat or Asian style pork buns—all without having to put on your coat and step outside.